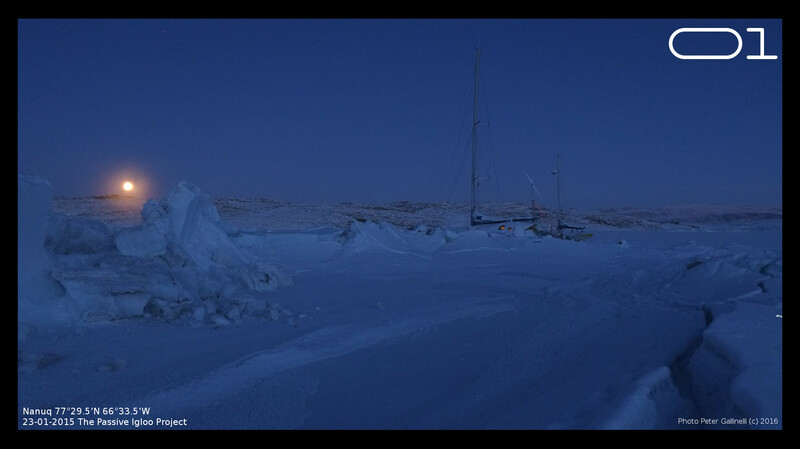 Due to an exceptional meteorological situation, temperatures are exceptionally mild for winter at 77°N: -20°C. The sky is clear and the big fjord is now in bright sunlight. 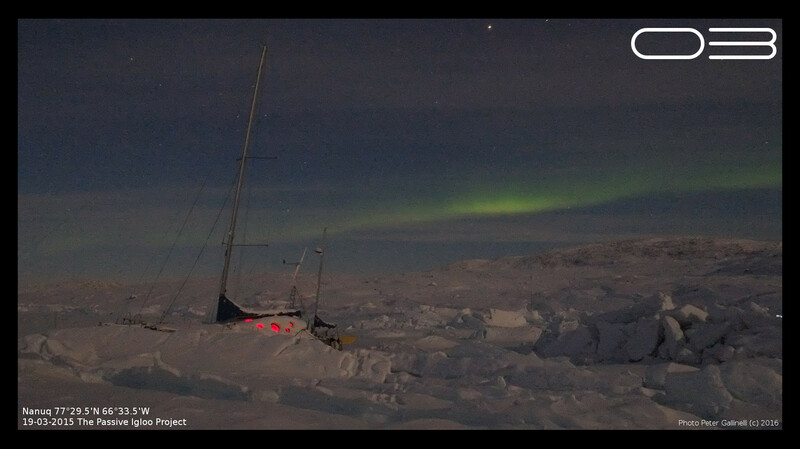 In Nanuq's Cove we still have to wait. 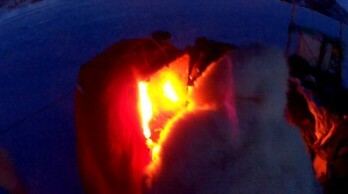 But today, 3rd of March, Nanuq gets her first light from the sun. After five months of arctic night we fully appreciate our relation to the sun, representing 99.9% of the solar system's mass and fueling close to 100% of all energy available on planet earth, free of charge and at our scale indefinitely. So time has come to clear the windows from the snow cover used to reduce thermal losses during the arctic winter. The sun is back and and time has come to inaugurate the solar photovoltaic system. The transition from night ot day is impressive. Twilight is never ending. We have the impression that there is more light than anywhere else in the world. Calculations prove our impression: whilst potential sunshine hours are the same at any location on earth (50%), in the Arctic one will observe only 20% of dark night, half of what occurs close to the equator. a) Still little or no wind. We now expect the solar system to take over once sunshine is bright. Four high efficiency panels sum up to 200 Watts. We have calculated optimum orientation taking into account apparent sun movement, obstructions and albedo of snow. 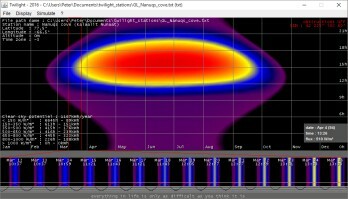 A MPPT (maximum power point tracker) regulator optimizes production as a function of cell specifications. b) Due to the movements of the ice shelf, the buried pipe system has been perforated and has become useless. This means that there is no more preheating of fresh air and as a consequence the exhaust air heat recovery system cannot perform to its optimum. c) The composting toilets are a success, even for our occasional visitors who discover this system for the first time: they are amazed. Especially odors are perfectly managed, much better than on a traditional WC. And at the same time the composting unit will digest all organic waste, in addition with paper and cardboard used to substitute sawdust or turf. In six months we have accumulated no more than six 20 liter bags of dry, clean incineratable waste the can easily be stored on board until the first reasonable call. 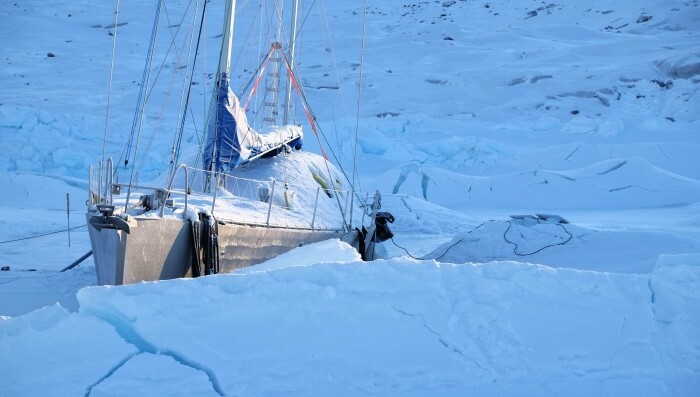 d) Our vessel, an Integral 60, is perfectly suited for this expedition. Life on board is most comfortable. 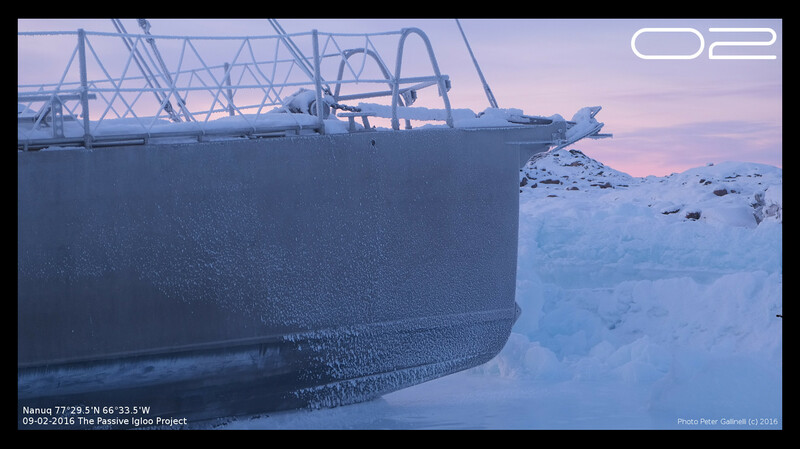 The big rear deck and garage are useful for the life on the ice shelf. The sturdy hull doesn't mind scratches or chocs. The sanitary systems are simple and efficient: they are inspired from the Greenlandic state of the art. 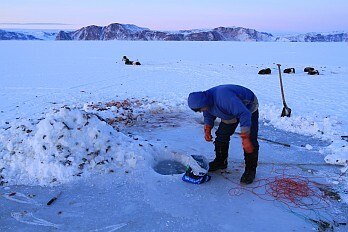 We draw water from a big plastic barrel holding fresh water from the lake or from molten ice standing in the cabin. Used water is collected in a bucket below the sink and emptied as required. We use about 30 litrers per person per week. The air-cooled engine doesn't require any specific attention and runs even when packed in ice or on dry dock. Last but not least, the reinforced thermal insulation is without any doubt a fundamental feature for this kind of navigation. e) We were doubting if our stock of food would be sufficient. Since January, our diet has been improved with fresh fish and game, adding essential calories and nutrients. By miracle we could save cabbage from September and have a fresh salad once in a time. We don't miss anything and fantasies of unavailable food have not occurred. f) Being cut off from the 'world', tools and materials for repairs and DIY are most essential. This applies also to knowledge and: encyclopedia, dictionary, calculation tables, atlases ... specially in paper format are important. Self sufficiency also means that one has the keys to questions, developing ideas and projects. g) The day-night rhythm has settled to normal ... for some time at least. This has allowed our sleeping patterns to return to 'normal'. After the months of twilight and darkness will follow the arctic day where the sun never sets ... stories to come. Although head lamps have undergone huge progress, when living in the wild one will account for daylight to organise outdoor activities. It is not a big surprise that wildlife has completely adapted to daylight patterns. Not only sunshine hours, but specially twilight have big importance and this is even more so in the high latitudes where the sun often 'hides' just some degrees under the horizon. Twilight is exceptionnally long and specially apreciated during the winter months. The Arctic regions have access to more daylight than any other part of the world, with a maximum at roughly 75° latitude. But solar energy becomes less as one moves to the north, which explains the low temperatures. The colours have been chosen so as to give a qualitative perception that can be useful for hiking or navigation (left hand capture). Whilst preparing the setup of our solar panels the same calculations have been extended to evaluate solar energy taking into account latitude, obstructions and the snow's albedo (right hand capture). In order to share daylight impressions, a twilight banner will accompany each news from now on (see above). Once again, news will be brought to you by visitors heading back home to Europe. Have fun! This is an important day: at a distance of 700 nautical miles distance from the pole and after months of dark, the sun appears. The inhabitants walk to a hill close to the village to welcome the sun with songs and celebrations. A great moment of joy! This is the end of the arctic night. Daylight grows in length at a spectacular pace. Each day gives more than an hour of additional sunshine. 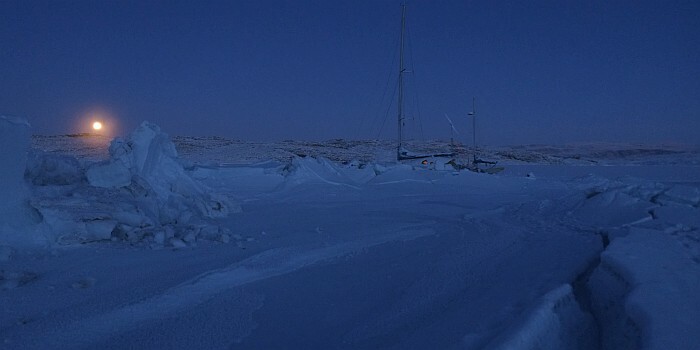 In Nanuq's Cove we still have to be patient for a week or two. The last sunshine was in October .. a long time ago! But, the arctic night is not complete dark. We experienced magnificent lights, including blue moon, aurora borealis, starlight as can be seen only far away from civilization. So we welcome the sun more as a symbol of change than a liberation. A new chapter of a voyage in time. The village is busy: the halibut season is at its maximum and the population has almost doubled. 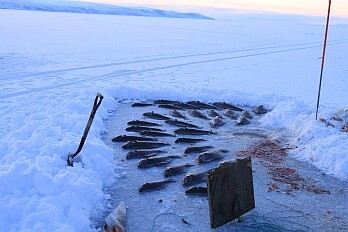 Numerous fishing cabins have been set up on the ice shelf at 4 to 5km distance. Everybody is busy and we are invited to participate. Meanwhile, the 'passive igloo' performs to entire satisfaction even though we experience temperatures that are well below what we had expected. 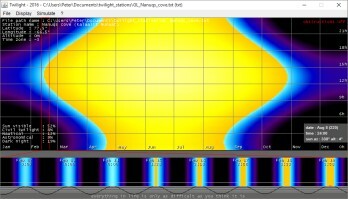 Besides a minor sensor failure, all system perform well since the beginning. Wind is still lacking, but soon we will be able to take advantage of solar radiation reducing need for artificial lighting, giving warmth through the windows and solar power. And as far as the crew is concerned, everything is fine. 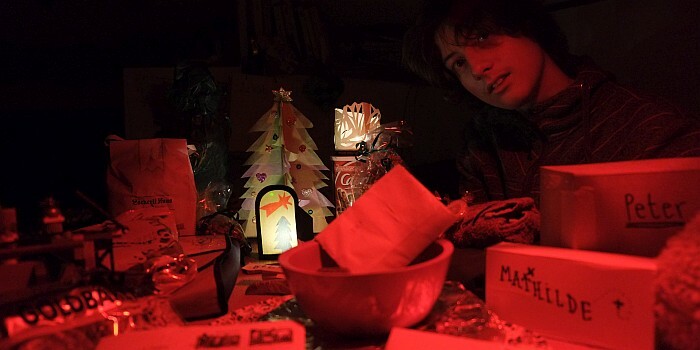 No nostalgia for unavailable food, items or warmth. We live in perfect harmony with our environment and the 'home' we have designed and built. No chores, but simply tasks. Like day, night and twilight, everything is progressive and takes time. Things happen at a natural pace and not in a race against time. It takes the time it needs. No more. No less. This is a real privilege that we share with the villagers. We are in the very middle of winter. Since the beginning of February temperatures are below -30°C. 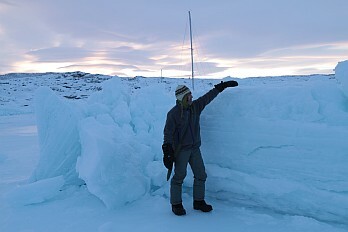 The ice shelf is more than 1m thick. Due to tides the ice crust twists and bends and compression ridges appear all around our mooring, some are of them are several meters in height. The ice cracks in an impressive way. We hope that the situation will not get worse. All we can do is wait and see. The Greenlanders call this the 'sissa' - pronounce 'shisha'. It is the transition zone between the shore and the solid ice shelf. It extends to approximately 10 times the spring tide range. In our place this means 20 to 30 meters ... and we are pretty close! 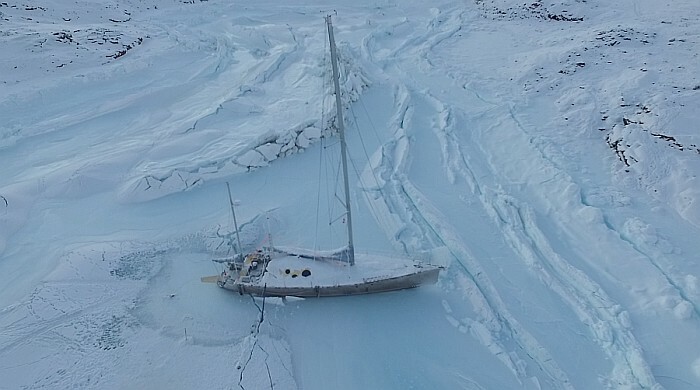 A winter mooring must be planned taking into account this feature, giving sufficient room and depth of water: three times the expected ice thickness should be a reasonable depth. The quality of ice depends on its origin. Fresh water such as found in lakes or the northern Baltic waters tend to be very compact and perfectly clear. 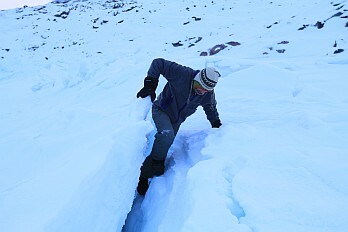 The locals venture upon as little as 5cm thickness, reserved to the expert!, and 10cm seem OK to stroll upon safely. 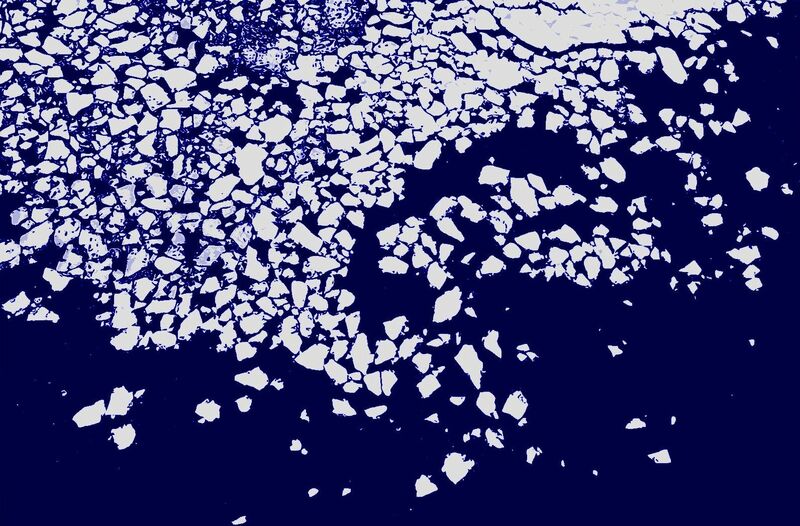 Sea ice is very different. More translucent than transparent, it contains many irregularities and is much more fragile. 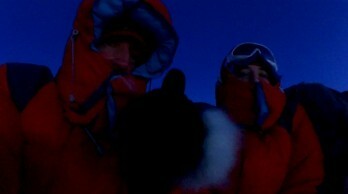 10cm thickness are a minimum - we used dry-suits - and 20cm are a reasonable minimum for a safe walk. We removed the mooring lines when the shelf reached 20cm. Strong autum gales give a limit to the anchor option since winds may exceed 65 knots. Best for safety are land lines. But they require an appropriate bay and long lines to keep safe of the 'sissa'. For this region we would recommend four 80m lines holding each 50% of the vessels displacement. Load straps are very useful to attach to rocks on the shore. This is not an interruption of program. But we may remind that 'the passive igloo project' would not have been possible without the help of numerous partners, passionate folks, friends, family and the will to make this project come true. We would like to announce the partership with SIG, services industriels de Genève. "SIG est une entreprise publique genevoise active notamment dans le domaine des énergies, de la gestion de l’eau et de la valorisation des déchets. Engagée résolument dans la transition énergétique, SIG pense que les énergies peuvent être consommées mieux… et moins. Passive Igloo est une initiative pertinente, innovante, et qui va dans le sens d’un avenir fondé sur les énergies propres et le développement durable. C'est pourquoi nous soutenons ce projet." "C’est une formidable nouvelle! Grâce au soutien de SIG, des systèmes énergétiques du 'passive igloo' pourront être complétés. Nous avions approché SIG car il nous paraissait pertinent que le fournisseur d'énergies de Genève s'intéresse à un projet qui explore les énergies de demain. Ce partenariat est pour nous une belle reconnaissance du projet." The polar bear to the right hand is Thomas, our friend and guide for this voyage to the capital at a days ride from our winter camp. 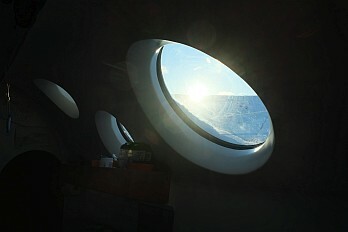 During the 48 hours stay in Qaanaaq, I have access to Internet. Incredible: a huge antenna dish connects this remote place to the South and the world of binary fluxes. We are too close to the pole to have satellite Internet. 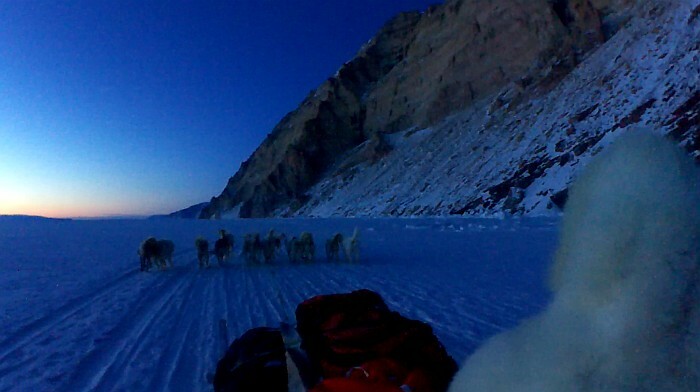 While Qeqertat peacefully lives at the edge of civilization, Qaanaaq and its 500 inhabitants expresses the duality of a society in transition from an ancient and traditional world into the 21 century of competing economy and technology. Western food and products contrast with ancient traditions. Discussions are very instructive and reveal a somehow bitter feeling toward Danish and American intervention. But on the other hand, nobody criticizes radio or TV that diffuse non-stop Western culture programs. From Savissivik to Siorapaluq, the people of the North have their own culture, their own language. A handful of 600 individuals living on a territory as large as a state. Will they succed to conserve their identity? The world is on the move and from a traditional culture of hunting, the wind blows towards fishing, a lucrative business. But for how long? Blue for cold, red for warm: 60°C separate outside from inside. We use simple solutions to make human life possible in one of the most magical but also lethal environments. The rules are very clear and allow for no improvisation. The abundance of wildlife stands in contrast with the harsh conditions. This is a lesson of life. This voyage is not reasonable, it is a quest. As such it opens new perspectives regarding our knowledge of the world, others and ourselves and the relationships between these. The access, from our sofa, to an almost limitless amount of information might give the impression that we can know everything. However, only the confrontation with the real world allows an authentic experience, an experience where our skills and our integrity play a major role. The act of doing is what makes the difference between knowledge and experience. Adventure is about experience. It is choosing the road least travelled, a road of unease, to unleash from the ballast of habits and certainties and allow to uprise: the horizon moves back as one rises: one can see further, wider, and maybe clearer. This is what we wish you for 2016: an extraordinary and adventurous year.